I had requested this book to read thinking it was a fictional novel that would have a field guide as its conceit for the storytelling. This is not that kind of book. Martinez quotes a number of articles written within the past two hundred years regarding the fields of parapsychology, psychology, and medicine. She also quotes the Oahspe bible, a text published in 1882 that had been the result of automatic writing. There are a number of accounts from different religions and spiritual traditions woven into this book, as well as extensive amounts of interviews with serial killers and sociopaths quoted. Because a fair number of them are people with multiple personality disorder described a sense of "other" coming over them, or all describing it as a demon, this is laid out as further proof of spirits influencing the material world. 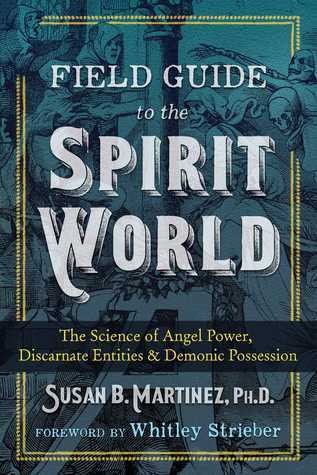 Readers that already believe in the spirits or are sensitive to such things will be drawn to a book like this. This gave me a bit of a headache to wade through because of formatting issues in the advance reader's copy, and it seemed to be more quotes than new text or a literal checklist to go through. Overall, not the kind of book I normally read at all.